Sri Lanka captain Dinesh Chandimal has been suspended for the third and final Test of the series against West Indies after he was found guilty of changing the condition of the ball during the second Test. What’s worse for Sri Lanka, Chandimal, coach Chandika Hathurusinghe and manager Asanka Gurusinha, could miss between two to four further Tests, after being charged with “conduct contrary to the spirit of the game” after their side had refused to take the field for almost two hours on the third morning. 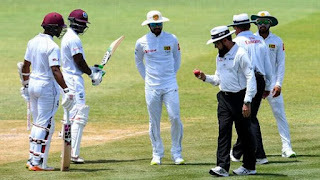 Chandimal had been charged by the ICC for ball tampering while the Test was on after video evidence indicated that on the second day’s play, he was taking sweets out from his left pocket, putting them in his mouth, before applying saliva to the ball within the space of a few seconds. Chandimal pleaded not guilty then and later attended a hearing with match referee Javagal Srinath, his team management and other match officials at the end of the match in which the video evidence was used and the Sri Lanka captain admitted putting something in his mouth but wasn’t able to recall what it was, according to the ICC release. Srinath, as a result, handed Chandimal the maximum punishment available under the code, which was two suspension points and a fine of 100% of his match fee. “After reviewing the footage of the incident, it is clear that Dinesh applied an artificial substance to the ball, namely saliva containing the residue of something he had in his mouth, an action which is prohibited under the ICC Code of Conduct,” Srinath said in the release. “The footage shows that upon receiving the ball, Dinesh took something from his pocket and put it into his mouth. After sucking or chewing whatever he put in his mouth for a few seconds, Dinesh then proceeded to spit on his finger and polish the ball with his saliva which would have contained the residue of the artificial substance that he had in his mouth, on two separate occasions". “During the hearing, Dinesh admitted to putting something in his mouth but couldn’t remember what it was, which I found unconvincing as a defence and the fact remains it was an artificial substance". It is understood that Sri Lanka had objected to the match officials’ initial charge partly on technical grounds, and this was the reason they stayed off the field for two hours. Although the tampering had occurred in the third session of the second day, the umpires had only viewed the corresponding footage before play on the third morning, and only after viewing the footage did they impose five penalty runs, and change the ball. Part of what Sri Lanka’s team management had objected to was the timing of the match officials’ charge. They were only told roughly ten minutes before the scheduled start on day three that a player stood accused of ball-tampering. They made the case that the issue should have been dealt with on the previous day itself. Both Sri Lanka’s team management and the board in Colombo have since been tight-lipped on what their other objections could possibly have been. Long before the hearing had taken place, the board had issued a release stating that it would “take all necessary steps to defend any player, in the event any unwarranted allegation is brought against a member of the team”. Chandimal has the right of appeal – an appeal that must be lodged within 48 hours. But it is likely that SLC’s focus will now move to the more serious “spirit of cricket” charge. If found guilty there, Chandimal, the coach and the manager could all stand to miss both Tests against South Africa in July, in addition to further ODIs. The charge is a Level 3 offence and breaching that carries an imposition of four to eight suspension points. One thing that complicates Sri Lanka’s situation is that there is no strong leadership at SLC at present. The board is effectively defunct because the previous administrators had failed to hold elections before their term elapsed. SLC is presently under a caretaker “competent authority”, appointed by the nation’s government, while fresh elections are organised. These charges have arrived at a time in which SLC leadership is especially inexperienced. The ICC’s imposition of a suspension on Chandimal, when it had not suspended Faf du Plessis for a very similar offence in Hobart in 2016, is understood to be down to a change in ICC policy. Following the ball-tampering incident involving Australia in Cape Town earlier in the year, match officials have been instructed to impose the harshest possible penalties to ball-tamperers. In any case, the playing conditions relating to tampering are in the process of becoming more stringent anyway, even if those new rules will not come into effect until the end of the year. The loss of Chandimal for the third Test is a serious blow to Sri Lanka. Even if an appeal is lodged, it is unlikely any further hearing can be held before Saturday, when the third Test is due to begin. Not only had Chandimal been in form – he made a hundred in the second Test – there are few captaincy options in the squad. It is possible that Rangana Herath, who was dropped for the second Test, will return to lead the side in the third (he has been stand-in captain on five previous occasions). Fast bowlers Suranga Lakmal, now the official vice-captain of the team, is another option.